The 92nd AGM of the Ancient Monuments Society took place on 5th July 2016 at the Charterhouse, London, by kind permission of the Master, Brigadier Charlie Hobson OBE (RM). 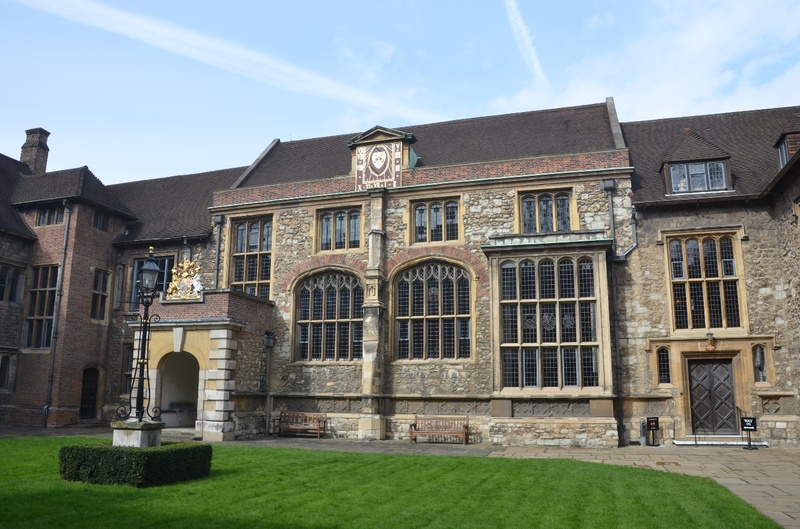 The Charterhouse must be one of the most evocative historic complexes in the capital. Fire bombs did their worst in 1941 (hence the careful rebuilding by Seely and Paget) but it remains an extraordinary survival. It occupies the site of the medieval Carthusian Priory, with clear remains in the archway of the Gatehouse. After the Dissolution it became a mansion of, amongst others, the great Howard family but was purchased in 1611 by the great philanthropist, Thomas Sutton – said to be “the wealthiest commoner in England” – who re-established it as a school and set of almshouses. The famous public school of that name was resited at Godalming in 1872 but the almshouses, for men only, remain – a unique functioning complex of homes (complete with new accommodation built in 2,000 to the designs of (Sir) Michael Hopkins). A new project, ‘Revealing the Charterhouse’ is in progress to create a museum and learning centre for school groups, designed by Eric Parry Architects, which will welcome even more visitors to this unique building and to its public gardens in Charterhouse Square. We navigated the building works successfully and with remarkably little inconvenience though all looked to be in full swing. 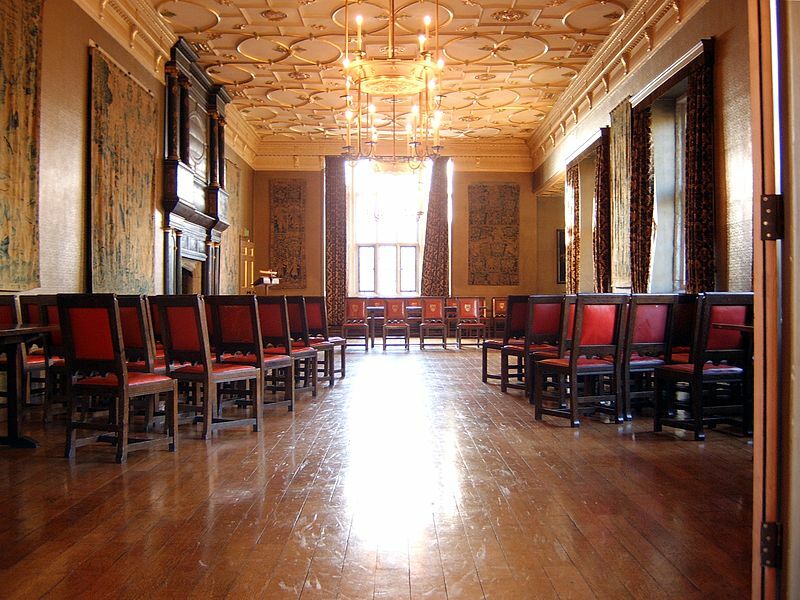 Early arrivals were welcomed by the Casework Secretary Lucie Carayon and Assistant Secretary Rebecca Whewell and shown to the Great Hall, an impressive room with all the grandeur and character of an Oxbridge College, where the Brothers of the Charterhouse were due to sup later that evening. We then proceeded to the Great Chamber where the meeting was chaired by The Rt. Hon. The Lord Inglewood DL. Image: Nicholas Jackson, Creative Commons. Members of the Council were re-elected unanimously and Matthew Saunders, the Secretary, delivered a report on the year’s events, including the current position of the AMS regarding its grant from Historic England which has recently been re-awarded. We admired the features of the room including the magnificent fireplace shown here, the coat of arms above which is in fact a clever facsimile, the original being at the Fitzwilliam Museum in Cambridge for careful restoration. Brigadier Charlie Hobson then entertained us with a fascinating talk on the history of the Charterhouse, delving far deeper into the potted history above, followed by a tour leading to the splendid 17th century chapel with its huge tomb to Thomas Sutton. Blessed with sunshine and blue skies, we retired to the gardens where a splendid tea had been provided by the team at the Charterhouse, with tea, coffee, sandwiches and various cakes, and where members, staff and Trustees alike had many an enjoyable discussion centred around the AMS and historic buildings in general. One or two attendees had even attended our previous AGM at the Charterhouse held twenty-six years ago! We would like to thank Brigadier Charlie Hobson for the fascinating talk, Lara and Maria of the Charterhouse events team for a very smoothly-run afternoon and evening, and all who attended and made the event such a success.